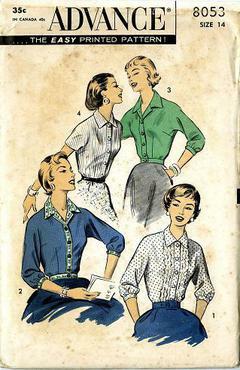 1956 Advance #8053 vintage sewing pattern, misses' set of blouses, size 14. One pattern...two blouses. A TUCK-IN blouse, dart fitted with rows of ruffled lace or other novelty trimming. Soft 3/4 length sleeves in one gathered into buttoned sleeveband. A WAISTLINE blouse with jacket effect has contrast collar and bands.